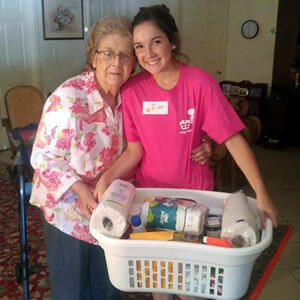 Laundry Baskets Full of Love delivers laundry baskets filled with household cleaning supplies and personal care and hygiene items to the homes of our many elderly neighbors and those who have suffered catastrophic loss in the Southeast Missouri area. We deliver individual baskets throughout the year based on recommendations from concerned neighbors, family members, social workers and service organizations, like churches and civic groups. We also host large events, such as our annual Project Christmas Basket and Make a Difference Day, where our army of volunteers gather to fill and deliver hundreds of baskets in a single day of changing the lives of others in need. There’s absolutely no catch to those who receive a basket. Each one is a gift with no strings or requirements. Whatever their situation, we want them to know that there is hope, and we trust that their basket will be a symbol of encouragement to them and a continuing reminder that there is a community that cares about them. When the basket is emptied, we ask that the recipient use it to do laundry or other household chores, and when they do, to please remember to say a prayer for the many volunteers and donors that make up Laundry Baskets Full of Love. We know that situations are mostly temporary, and we trust that at some point in the future, they will remember the gift of their basket when they have a chance to help someone else.